There are some parts that I will still use this method on. Valve covers and oil pans with internal baffles like to trap blast media. Unless you remove the baffles to thoroughly clean out all of the media afterwards, media will get trapped in the part. Later when these parts are installed in the engine, the media can get washed out by the oil and circulated around the engine. Blast media will quickly score bearings and journals inside the engine which can result in an engine rebuild. Not worth the risk to me to media blast these types of parts. First, let me say that when I started powder coating, I had no air compressor and no sandblaster. I bought the Craftsman Powder Coating Gun that did not require an air compressor. I was scared of the cost of a large air compressor and it required an electrical outlet that I was unfamiliar with. 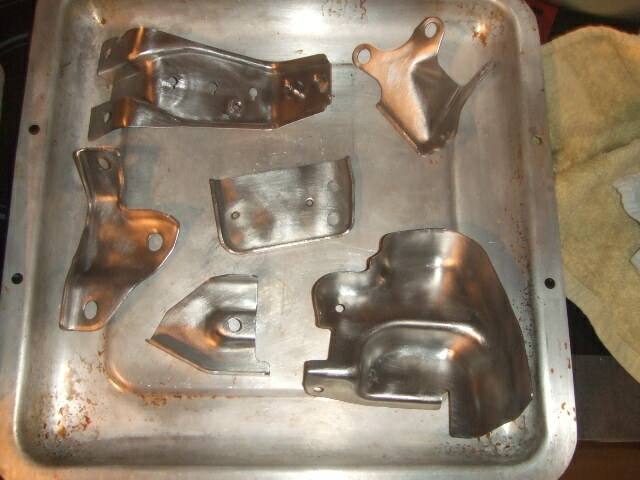 I used the methods that I am about to describe below and in the end, I bought everything I would need to sandblast. I eventually did buy an air compressor and learned a lot about them. If you would like to understand more about air compressors and what type you will need to sandblast, head over to "How to Choose an Air Compressor". Assuming the part you are planning to powder coat is not brand new, it probably has old paint, rust, or corrosion on it. To prepare a part for powder coating without a sandblaster, the following are different methods that I used. 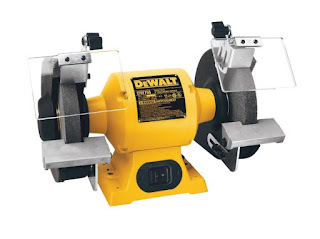 The first step I used was a bench grinder with a wire wheel. 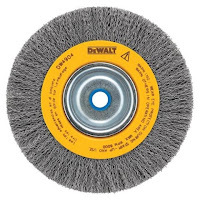 Note: if your part is stainless steel, only use stainless steel wire wheels. The wire wheels are good for removing paint and rust. They get old dirty metal down to clean bare metal. They take much longer than a sandblaster, and I was okay with that at first but it becomes tedious. Also the 8" wire wheel will not reach into the crevices of your part. After finishing all the larger open areas with the bench grinder, I then switched to smaller wire wheels mounted in a drill. They work great at getting into almost all of the small crevices. This is around the time when I setup my make-shift peg board to keep myself organized. Now that I use a sandblast cabinet, the board has been decommissioned. After I got into all of the areas I possibly could with the various sized wire wheels, I used a Dremel with a flex shaft and a very tiny wire wheel . 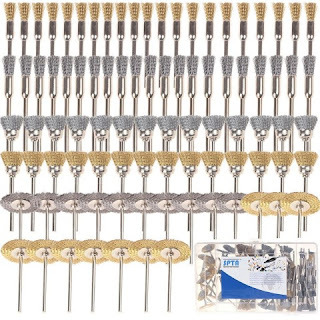 The little wire wheels wear down very fast so I learned to stop buying the Dremel name brand ones that were $6.00 each and found this assorted pack which comes with every size you need to get to any crevice and they are much cheaper. Just keep in mind that they fling sharp bristles as you work. Protect your eyes and skin. 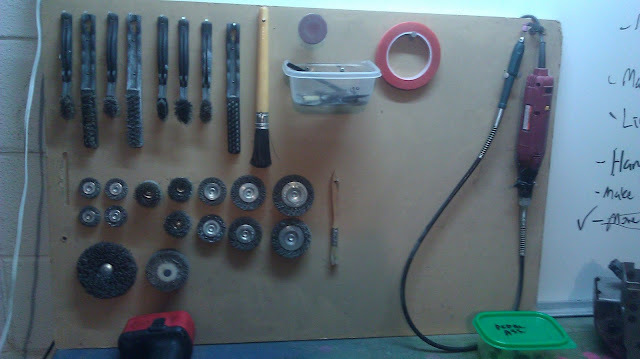 Another simple way to keep organized was this make-shift Dremel attachment holder. 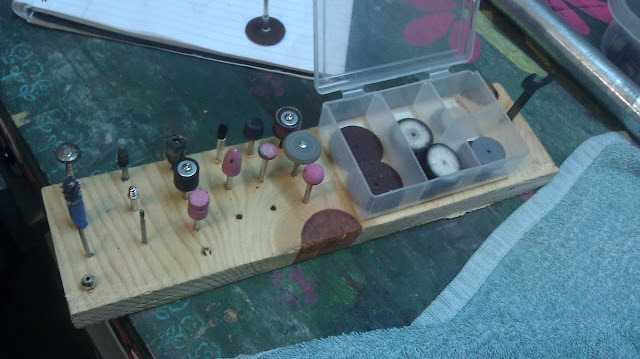 I hated the Dremel case so I just drilled 1/8 holes into a block of wood, and now my Dremel attachments are always handy. The container is held onto the wood with double sided tape. Little things like this keep me sane in the garage. Looks good, but do not stop there. 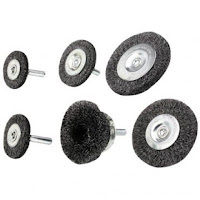 Wire-wheels and wire brushes leave very smooth polished scratches in metal. This results in a shiny appearance and a shine is the result of a smooth surface. This leaves little for the powder coating to grab onto and the results are coatings that chip off very easily. The next step is bound to be your favorite: Sanding. While sanding, your aim is to remove the shine. I always used two consecutive steps, first 3M 220 Grit and then finish it off with 3M 400 Grit sandpaper. Remember, the goal is to add texture, not to remove a bunch of metal and change the dimensions of the part. After sanding, you can then re-clean your part and go on to powder coat it. However, keep in mind that when you rinse any cleaner off of the bare metal part, the part will want to rust very quickly. It is best to do the final rinse in cold water and dry it as fast and as thoroughly as possible. I recommend wearing disposable gloves while drying and handling the part after it is clean. Touching the part can cause little rusty fingerprints to show up due to the salts on your skin. After the part is dried, do a quick bake in the oven to remove any remaining moisture. I still found the powder coating was less durable than desired so I broke down and bought a sandblasting cabinet and an air compressor. Not only is it way faster, the powder coat was much more chip resistant. I still wanted to cover these methods for those that are not ready to invest in blasting equipment yet. If you are planning on powder coating parts for paying customers, absolutely do not use this method, sandblasting is the only way to go, read this Media Blasting article to realize the full benefits. To give a beautiful shape or to get nice piece you need to sandblast and you must need an air compressor for sandblasting. Remember sandblasting requires lots of power and you should always use an air compressor with at least a 2 horsepower motor. You can try best air compressor for sandblasting. Great site, it's a real help! I'm wanting to recoat some motorcycle rims of mine. The factory powder coating is chipped in a few areas around the rim edge from tire changes and I want a different look. I'm wondering if the factory surface finish would be enough roughness if I only opt to chemically strip the old coating off and forego the sand blasting. It would mean a great savings as far as equipment for a one off project. Thanks, most likely the factory just prepped the surface with an iron phosphate wash over smooth metal. It helps with adhesion of powder coat but it is no where near as good as an actual sandblasted profile. If I were you, because they are wheels and subject to more abuse than most parts, I would find a local sandblaster and just have them blast them for you, and then powder coat over them. Whatever finish you put on them will last much longer this way and shouldn't cost too much. If you don't want to go that route, you can strip the powder coat and sand the wheels to give you a profile. If you are powder coating, you can sand with like 80 grit sandpaper, the powder coat will fit in the scratches. Thanks for the advice. Outsourcing my sandblasting is a good idea! How about electrolysis for paint and rust removal? If you are already setup for rust electrolysis, then that can work. I gave it an attempt using a PC powder supply instead of a car charger and I found that removing the converted rust afterwards made the process not worth it for me. I have heard great things about Evaporust and would just go that route instead as the part comes out completely rust free. However, you will still have to prep the surface in some way before powder coating. If you don't want to get into sandblasting, you can use sandpaper and/or an Iron Phosphate conversion coating. How necessary is sandblasting on a new part? I'm going to attempt to coat with the airless craftsman gun some new Hammond aluminum electronics enclosures (the 125B model at first, but also some 1590B boxes as well). 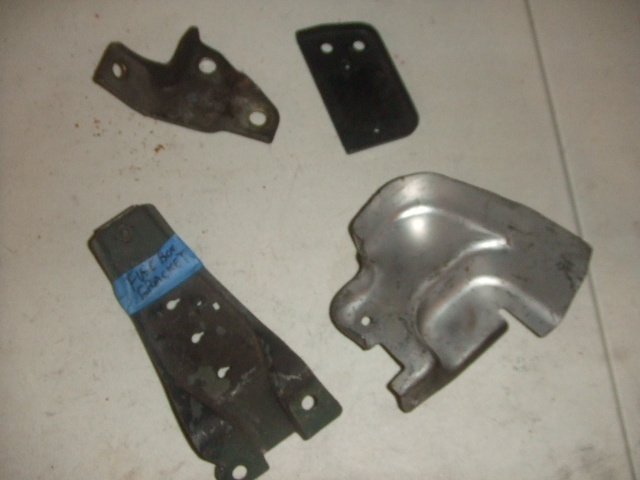 They are cast aluminum, brand new, sealed, never been coated with anything. I am currently rattle canning it and to prep, I sand with 150 grit sandpaper and then wipe down with acetone before baking. Then I spray and bake at a low temp to speed up the curing of the enamel spray. Anyway, they are rectangular with no crazy crevices that I'm worried about and I'm wondering if I'm wasting my time if I don't sandblast first or if my 150 grit scuff up is enough for the powder coat. I would recommend blasting any parts that are about to be powder coated, even if they were brand new. The profile it adds to parts allows the powder to adhere better. 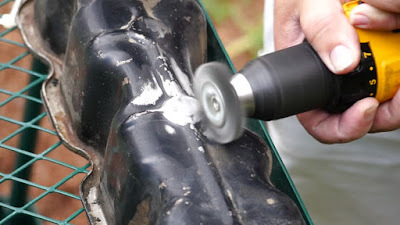 However, if you do not have access to a sandblaster then sanding for adhesion is the next best thing. After all, it is what painters use to prep for paint. One more step since they are cast aluminum is to outgas them in the oven prior to cleaning and sanding them. This helps to remove any trapped oils in the metal before coating. I usually bake parts at 430-450 degrees for 30 minutes to an hour (or until they stop smoking). Then clean, sand, and do a final clean. This site is absolutely great! I'd just like to add that in some regions sand blasting is forbidden by law, as where I live (Brazil). Been looking for alternative methods since I found that out.